I cannot stop watching the news on the revolt in Egypt. It is really an historical event not only for Egypt, but also for the entire region. People in Cairo, Alexandria and Suez have gone to the streets to bring down the government of Hosni Mubarak. To give context on how big this is it. Mubarak, who is 80 years old, has been in power for almost 30 years. He came to power after the assassination of Anwar El-Answat in 1981 by Army officers oppose to the Israel-Egypt peace treatment. The agreement, highly sensitive at that time, made Egypt the first Arab nation to recognize Israel. 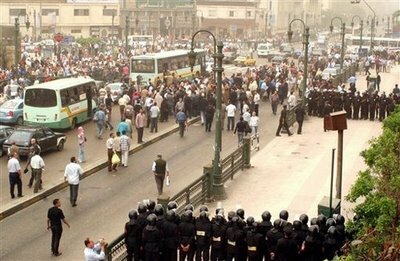 Mubarak came through the military ranks, the Air Force, which is highly respected in the country as oppose to the police. As we are looking to these events across the region: The Jasmine revolution in Tunisia, the “Day of Anger” in Lebanon, protests in Jordan, Yemen, and now Egypt, I cannot stop asking what has sparked these protests. Given the history with Iran, Iraq and Afghanistan, there is always a concern that Islamic religious parties are driven these protests. Though we can all agree that the events in Tunisia may have caused a domino effect, I think we need to look at the social, economic and political picture to understand the root of the problem. Let’s look at Egypt and Tunisia. From a political perspective, dictators, with oppressive regimens, have ruled both countries in the last 30 years. In Tunisia case, Ben Ali was in power since 1987 while in Egypt Mubarak from 1981. In both countries, the political opposition is non-existence. They have been beaten, jailed, exiled and almost eliminated. However, we also have many non-democratic regimens across the regions such as in Jordan, Saudi Arabia, Syria, Sudan, Yemen. Does this mean that they are likely to follow? Though t is hard to predict, we cannot state that having an authoritarian regimen is the only cause of these events. From a social perspective, both countries have a young homogeneous population with a sizable and educated middle class. In Egypt, which is the most populated country in the Middle East, Egytians account for 91% of the population with an average age of 25. According to the renowned economist Galal Amin, educated, middle-class citizens constitute between 40 percent and 50 percent of Egypt’s population. In Tunisia, the middle class is estimated to account for almost 60%. This is a big contrast from Jordan, Saudi Arabia, Syria, Yemen, Sudan… Thus, having a sizable, educated and young middle class might be playing a factor in these protests. In the economic front, both countries are going through really hard times. Last year the unemployment rate stood at 9.7% in Egypt while 14% for the same period in Tunisia. Both countries have also one of the highest import tariffs on agriculture commodities. In other words, the price of basic staples such as rice, bread, and corn has significant increase in the last few years. These products have been heavily subsidized in other countries in the region such as Syria and Iran going through the same hardship. In conclusion, contrary to the default perception in the US that religious parties might be behind these movements, the reality cannot be more different. The main drivers might just be unemployed young educated middle class citizens under an authoritarian regimen who are fighting for a better future.